I'm really thrilled to be sharing this tutorial with you today. I came up with this idea after I got annoyed with my sewing machine sliding around on the table, especially when I was sewing quickly or free-motion quilting. It makes such a difference to have a sewing machine that stays where you want it to! It also adds a lovely personalised touch to your sewing space. - usual notions like thread, rotary cutter and ruler, scissors, etc. The thing that makes this mat non-slip is this non-slip matting. It's the type of thing you might put in a cupboard or drawer to stop things sliding around. These pictures are intended to give you a good idea of what it's like. I bought mine at Spotlight (essentially the equivalent to Joann's), but you can also find it at hardware stores and big box homeware stores. You can find the exact brand I bought here, and this is a version which looks pretty much the same which I found on amazon. The colour doesn't really matter, because you won't see it once your mat is finished. First, measure your sewing machine to work out how big your mat should be. I would recommend measuring the base of your sewing machine and then adding at least 2" on each side. I have a fairly small sewing machine and I made mine 12" by 18". Choose the fabric you will use for the top of your sewing mat. I used a single cheater print fabric, but you could definitely piece something if you prefer. Make a quilt sandwich with your feature fabric, the low loft cotton batting, and your backing fabric, using your preferred method. Quilt as desired. I simply followed the lines of my cheater print fabric. You are going to baste the non-slip matting to your quilt top, and stitch through all the layers to securely attach it. You don't need to quilt it densely, just enough to make sure it doesn't bubble or move around too much. Once you have decided on your quilting lines, use your favourite method to mark them on the quilt top. You can see that I used a hera marker - it's absolutely my favourite way to mark quilting lines. This is the one I have and I love it. Use the curved safety pins to base the non-slip matting to your quilt top. Place them not more than 4" apart, and if possible, avoid placing them on your quilting lines. This part is a little tricky, and you will really need a walking foot, because the non-slip matting is going to want to stick to your sewing machine. Get your quilt set up and ready to go, and drop the needle down. You may need to lengthen the stitch length beyond what you would normally use for straight-line quilting - I set mine at about 3.75 (the maximum stitch length on my machine is 4). I would normally use a flat hand to gently guide the fabric through the machine. This will not work, because putting any pressure on the quilt will cause it to stick to the sewing machine. What you need to do is lift the quilt up around the presser foot, and let the feed dogs and your walking foot do their job. It will feel really strange, but if you go slowly and carefully, it will work. This project is a great candidate for machine stitching the binding. I learned from Rita at Red Pepper Quilts, and I still think her tutorial is the best. If you do decide to hand stitch the binding, I would recommend attaching it to the back first and hand stitching it to the front. Ta da - you're finished! Now you just need to test drive your new sewing machine mat - a perfect excuse to sew something new! P.S. You will have a fair bit of the non-slip matting left over - try putting a piece under your sewing machine pedal. It will stop creeping away from you as you sew! 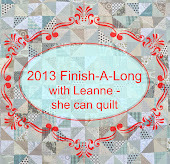 Don't forget to link up your Q2 finishes - the Q2 post-quarter link is open and it will close at midnight MST, July 7, 2013. And if you still have some UFOs I hope you will join us for Q3 of the FAL, Q3 FAL lists can be posted starting on July 8. Very clever idea! I definately have issues with a sliding machine when I quilt. And don't even get me started on that foot pedal! She is a clever girl, that Adrianne! I love the idea of putting it under the sewing foot too! I'm forever losing it under the table! Thanks for sharing this idea! Great idea. My machine stays where it's supposed to but not the foot pedal. I'm making one of these for that wandering pedal thanks! oh, goodness. This appeals to my form over function character. I was using an old rubber bath mat under my foot pedal. Time to get some better form! thanks!!! I'm blown away by the foot pedal tip...total light bulb moment! Thanks!! It might be helpful to put paper between the machine and the project so it would not stick and then tear it away after stitching. Good idea for slippery machines. Very nice tutorial. I would suggest using tissue paper on the non-slip stuff against the sewing machine...it will keep it from gripping and works great. Easy to remove later! Great tutorial, thank you!! If you have carpet in your sewing room then a bit of Velcro on the underside of your machine pedal also works wonders!